I don't have any proof as I don't think they had invented the printing press yet when I first got my license at 14 So I was legal in 1968 but had ridden for many years before that. This is me in 1964. That's 52 years on two wheels! And a Honda SL 100 in '71 was my first, and so far, only new bike right off the dealer floor. Minor Threat GSP owns the UFC! Wendell Rea, 1942 Harley 45 CI. Notice the front knobby! Here's the 'usual suspects' again taking a morning break on a nice Sunday ride. One Sunday ride took 'em to the top of Mount Evans, elevation 14,264. This was back in the day before it was paved all the way to the top. It was, however, paved here if it hadn't been for the snow. I was recently in a similar situation on my Rally Twin coming over Pearl Pass. I thought it was touchy enough, and I didn't have a FOOT CLUTCH!!! Yikes! The clan started out from my Dad's house in Wheat Ridge, which is a stone's throw from Golden, CO. They usually left about 8:00 a.m. If you didn't arrive on time, they'd leave you. Hard knocks. They headed up to Boulder, CO and followed the nice, twisty, scenic Boulder Canyon to Nederland. From there they headed through the town of Eldora and up Arapahoe pass. After some back tracking and de-mudding operations, they finally found the right trail and made it to the top at 11905 feet elevation. Nice day! I also think these guys could've invented the "No Fear" logo. I have fear when it associates a 750 lb hard tail with a stream crossing on a trail. These guys really deserve some respect for being able to pull this off. Or they deserve to be taken away in straight jackets, I'm not really sure. Not that they didn't dab once or twice. OK, maybe they dabbed about 100 times, but they still made it across. Now it's time to take a break and dry out. These guys also had a lot of fun just playin around. Imagine getting a couple feet (OR MORE!) of air on a 750 HARD-TAIL Harley! This makes you GS-jumpers look like whimps, with your fancy rear suspension and all. Sheesh! But the most insane (read: talented) member of the group in the area of piloting a Harley 74(7) through the air was a fellow named Kenny Erie. If Kenny was alive today and about 50 years younger, Im sure hed be one of the top names in freestyle! These guys weren't shy of riding on a bit of snow, either. Here's Mike Sadusky on his 50 Harley. Man, I really envy this guy's legs. I bet he could straddle the 950 Adventure-S with his knees bent. Me, on the other hand, can't physically touch both toes to the ground at the same time. Mike used to drape his legs over the handle bars to stretch on those long road trips (no joking!). Who needs hiway pegs? These were taken up by my Dad's cabin on Mt Thorodin. Wanna park, but you're too lazy to put the side stand down? Just cram it in a snow bank and leave it like my dad did. Mike and Kenny are in the process of parking. These guys were never short of play time. Once again, Mike's extra long legs save the day. Well, almost. And they liked a bit of dirt tracking to boot! So, as it goes on Thanksgiving day youre supposed to think what youre thankful for. Im thankful for my dad being a nutcase in the 1950s, buying my brother Wayne and I Z-50s in the 70s, and riding every chance I get with my friends and family! Offsite photo links... What a shame. This was one of my favourite posts ever. eakins and enduro16 like this. Gee. Hate the photos are gone. I've been checking out this thread, off and on, for years. Oh well. I guess somewhere back in these 37 pages is an explanation why, as if the guy owes anybody an explanation. marshrat, JagLite, just jeff and 1 other person like this. My dad was into competition hill climbing in the late 60's to early 70's. He also liked to tour, including a lot of what we'd call adventure riding today. Back then it was just plain ol' riding and camping. Here's a shot of him in a hill climb. This is me, 2 years old, sitting on my dad's Harley Sprint 250, back in 1964.
bomose, vector6 and JagLite like this. .....This is me, 2 years old, sitting on my dad's Harley Sprint 250, back in 1964. Harley Sprint 250, aka Aermacchi. Here's a couple nice ones. The look-of-determination on Your dad's face is priceless. I hope the look of serenity and happiness on your face remains the same, every time to throw a leg over your bike. I think I will go for a ride. MarkM and JagLite like this. The side pic shows me in 1946 my 1st year. 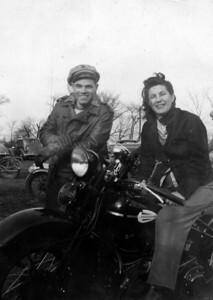 Pic of me with parents at the PMC Turkey Run Oct/Nov 1945. I was was inside keeping warm, until my big day, which was 01/05/46. enduro16, TDC_ERock, JagLite and 1 other person like this. This was the original thread that brought me to the place in 2004. My god, why are all the relevant pics now gone? You can blame Wes, you can blame the original photo host, you and blame ADV but for fucks sake, someone should be able to put the pics back in place, given the unlimited technology of today, right? This was THE epic thread in ADV back in the day. I can't believe it's been left to rot. WRC51, Tom S and bmw318tech like this. bomose, eakins, enduro16 and 8 others like this. The woods of northern IL. First bike-1966 Jawa CZ 50cc. Bought from high school shop teacher (Johnny McOwen) in 1969. No proof just memories. I was 12 years old. My first bike was a new 1964 Yamaha 80 street bike, I was about 13 or 14 years old. (Thanks Dad) Been riding regularly since then, just a few years of very little riding when my kids were toddlers...and then they got bikes. I saw this yesterday, which may help some recover or at least see some photo's! fasttortoise and JagLite like this. 1998 San Francisco to Acapulco, 1992 Suzuki DR 350 S . Beach camp Guaymas, Sonora north of San Carlos. Saso, Stomp and JagLite like this.